If you’re worried about being stuck inside under piles of snow or similarly dodgy weather, Amazon’s got the perfect way to keep your spirits up; they’ve cut prices on a handful of our favorite board games. This includes the hilariously wicked Gloom at $15 ($10 off), Betrayal at House on the Hill for 44% less than normal ($27.90), and co-op classic Pandemic for the slightly reduced cost of $35.99. If you’ve not seen these before, take it from us: they’re absolutely worth your time. 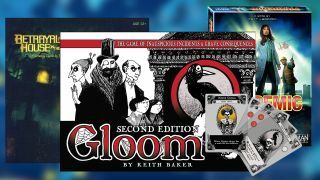 Gloom gives players control of a family of Victorian caricatures, but the twist is that you’ve got to make your opponents’ families happy… and yours so miserable they die. Meanwhile, Betrayal at House on the Hill is a horror game with a board and scenario that changes every time you play. Finally, Pandemic puts the world’s safety in your hands as you try to cure outbreaks of deadly disease. In our experience, these are guaranteed crowd-pleasers if you have people round. They all boast a lot of replayability and they’re among our best board games. Want more recommendations? Don’t miss our list of the best cooperative board games.